We can count on some basic things in this life: you know, rain showers in April, the New York Knicks losing basketball games, and…Liberals playing the race card. Some things never change. True to form, it’s April and we’ve been getting quite a bit of rain. It’s NBA playoff time and the Knicks are already on vacation. And it’s another day–any day–and Liberals are using race to advance their agenda. Yes, it is common for the Left to create, capitalize off of, and then feign concern over issues of race. So nothing has changed there. But I have to admit that it threw me to see our so-called post-racial president so comfortable playing that card for all the world to see. Just pulled it out and threw it on the table–no big deal, right? Watch the video below and then keep reading. So the Democrats’ November game plan is to gather certain groups and get them to the polls, for once there, you can expect them to vote your way; after all, that’s what they do. We’re paying particular attention to those House members who voted in favor of Obamacare and represent districts that Senator John McCain and I carried during the 2008 election. All hell broke loose after that Facebook note as the Left went into selective outrage and stupidity mode. But the president can target certain groups that he expects to line up, be counted, and do his bidding. How are his comments acceptable? They’re not. They’re offensive. His tactics are not new for the Left, but they certainly are beneath the office of the president, who was elected to be the leader of all Americans, not just the pockets of people he feels he has in his back pockets. Furthermore, as one of those Black Americans, I am insulted at the thought that anyone would expect me to take my place and do as I have done. The president ought to be familiar with the phrase, “You’re gonna have to come correct”–and he’s going to have to do just that if he wants to retain those seats come November. Now, I’m just a teacher from the state of New York, but I have a novel idea for President Obama, Nancy Pelosi, and the rest of those puppet masters in Washington. How about you offer all American people something to vote for? How about you embrace policies that will not put our children and their children in debt before they take their first breath? After all, perhaps more than all others, we “African-Americans and Latinos” are further hampered when we enter the world with that type of burden already upon our shoulders, and since you’re so familiar with race, you should be well-aware of that. I have another idea. How about you stop supporting the massacre of our children in the womb and calling it choice? Abortion is wiping out the Black and Latino populations more than any other. But of course, sir, you would know that, as you are a staunch advocate of Planned Parenthood, which purposely sets up shop in these communities. Margaret Sanger would be proud. That was her plan. How about that, Mr. President? As an educator, Mr. Obama, I ask you to figure out a way to improve the educational success of the people you want to come out in droves for you in November. You can start in D.C. Then make your way to New York. Come to my school district, sir, where they will be cutting almost 50 jobs at the end of this school year. And we know the impact that will have on all, particularly the children of those “African-Americans and Latinos” you want to do you some favors at the poll. How about that? One last idea. President Obama, how about you surround yourself with people who will stop telling these same groups of people that we’re victims, and will start telling us the truth–that we can be victors not over-reliant on “the man”–you know, the government? Yes, I’m outraged at the president’s audacity of arrogance as he sits in front of his video camera and rallies the troops by pushing his same politics-as-usual nonsense that is detrimental to the very groups of people he’s singling out and duping into submission. Give people something to work with, President, and maybe you won’t have to resort to the same old, same old race games, because more and more of us are not moved by your race. We want results. So come correct or don’t come at all. 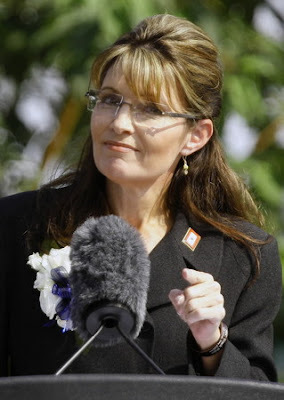 Now, let’s contrast President Obama’s approach with that of Governor Palin. When she rallies Americans to remain encouraged and focus on November, she addresses all Americans. We all have a stake in the elections, as we all have been affected by the policies of the current administration. This is just the beginning of our efforts to take back our country. Consider yesterday’s vote a clarion call and a spur to action. We will not let America sink into further debt without a fight. We will not abandon the American dream to government dependency, fewer freedoms and less opportunity. Change is made at the ballot box. If we work together, we can renew our optimistic pioneering spirit, revive our economy, and restore constitutional limits. Stand tall, America. November is coming! Governor Palin asks for all to take a stand by voting in November to undo some of this promised change the president is unfortunately delivering. She neither exempted nor exploited Blacks, Latinos, or even women. She spoke to people as people who care about their country. While I’m sure that there are people who are inspired by Governor Palin because they relate to her as a woman, a wife, and mother, who find delight in perhaps casting their vote for one who may be the first female President of the United States, these same people often voice a desire to join with other Americans from all walks of life to move forward toward common sense solutions. She calls on them for that reason alone; they are Americans. And while I do find wisdom in reaching out to articulate our message to different communities, I do believe in coming correct to those people. And coming correct is not being presumptuous that you’ve got my vote in the bag. Coming correct is coming with a message of real hope and change, which is a message of uniting with all so that together we can move forward and better understand how each of us benefits from these solutions. Thus my support of Governor Palin; she comes correct. The special election yesterday in Massachusetts was truly amazing. It is a clear indication of things to come and a demonstration of the momentum we all share in the fight for the values and policies that will get our country back to work. The commonsense conservative principles of liberty and fiscal responsibility are on the rise, and that’s why I’m going out and campaigning as hard as I can to make a difference. I can’t wait to join all of you in supporting these great candidates and many more over the coming months. Governor Palin’s focus is preserving America’s values, her work ethic, and her future. She has set her gaze on 2010 and the support of candidates who will progress this nation. We’re all in this. She doesn’t take for granted that she owns certain groups of people, and she doesn’t exclude anyone. She appeals to Americans–period–which is exactly the way conservatives and Tea Party activists always conduct themselves. People like Governor Palin and Tea Partiers, who have never separated people into categories based on race, are accused of masking their prejudice by using coded language for “white America.” Nonsense. Meanwhile, the President of the United States can come right out and say people need to basically bus Blacks and Latinos to the polls. Somehow that game plan is okay to Liberal loons because…well, that’s what far Left Liberal racebaiters do. But Conservatives have a race problem? Excuse the pun, but if that’s not the pot calling the kettle black, I don’t know what is.